Over 120 curious area residents stopped by the Elk River Municipal Utilities and City of Elk River Electric Vehicle exhibit at the Farmers Market on September 13th. 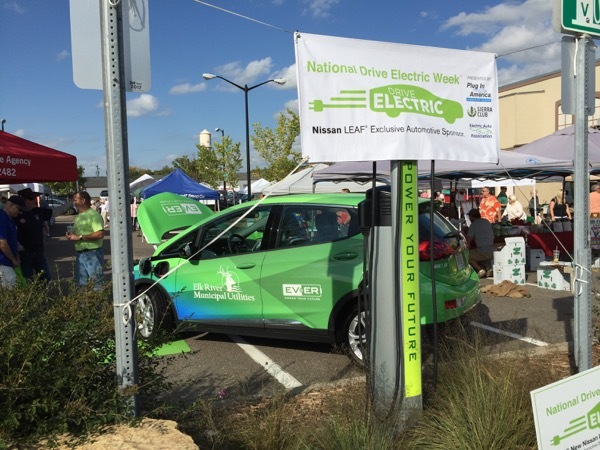 The event was part of the National Drive Electric Week celebration (September 8th – 16th). Area residents were able to talk with EV owners as well as Elk River Municipal Utilities and City staff and get firsthand information on what it’s like to own an electric vehicle. In addition to the Utilities Chevy Bolt and the Cities Mitsubishi Outlander area residents brought their vehicles to share. On display were Chevy Volts and Bolts, a Nisan Leaf, and a Zero SR motorcycle. In addition to general electric vehicle information curious residents learned about the opportunities that exist in the Elk River Municipal Utilities service area. There were many residents that were interested in the affordable rates offered by ERMU for charging electric vehicles during lower demand periods, rebates for the installation of an EV charging unit, and other incentives that are available to individuals purchasing an electric vehicle. There were also many questions on how public charging stations work. Currently ERMU has three public charging stations available. They are located at the downtown public parking lot on Main Street, at the fuel station at Coborn’s on Hwy 169, and in the parking lot of City Hall/ERMU on Orono Parkway. These public charging stations are available to any person that drives an electric vehicle and is in need of a little juice for the road. Elk River Municipal Utilities and the City of Elk River will have two vehicles on display during the farmers market for people to look at and ask questions about. The vehicles on display will be a Chevy Bolt which is 100% electric, and a Mitsubishi Outlander which is a hybrid sport utility vehicle. During the event people can stop by and learn about the vehicles, time of use rates, costs of ownership, and range capabilities of the two types of vehicles. Registered attendees report 365,850 electric miles driven.